A little girl watching her mother putting on her make up, getting ready for a night out. Nivea cream scent (with its special bouquet of aromatic essences) and violet-laced, fluffy, retro powder. Soft musky roses floating on a cream bowl. Pink satin pointes with long silken ribbons ... This could be a recipe for tisane-sipping and Fabio-jacketed novels for spinsters off to bed at eight in their pink liseuses; it ticks all the predictable "romantic roses" boxes. But it's not. Drôle de Rose by L'Artisan Parfumeur manages to bypass the staid for the cheerful and the delicate and to render old new again. You just need a bit of an edge to turn this into the playful fragrance it really is and not into something from your grandmother's vanity. Comparable to the retro nuances of Lipstick Rose (Frederic Malle), whereas in the latter the overt sweetness and lusciousness can upset a sensitive stomach ~such is the speckled rouge approach~ in Drôle de Rose everything is painted like a light stain. Plus the L'Artisan came many years before, in 1996, pre-emptying a niche trend by far. Perfumer Olivia Giacobetti was remembering the formative images of her childhood and the scent of makeup plays hugely in such scenarios. The combination of rose & violet has become a classic in recreating this effect, since most lipsticks were typically further aromatized with these essences to render the wax's smell less obtrusive. I call these "mock makeup perfumes", fragrances evocative of cosmetics, putting me in a made-up mood before even hitting the top of the By Terry trousse de makeup, which is something one can appreciate when too bored to do one's face. Out of these scents, some go for the pancake-makeup glamour of the 1940s, thicker and lusher, Technicolor; Lipstick Rose as well as Broadway Nite (Bond No.9) opt for that effect, retro glamorous pin-up. Others go for transparency and a super-soft, kittenish hint of fluffy ivory fur with a hint of violet pastilles; to that category I put Meteorites by Guerlain, Love,Chloe (parfums Chloe) and indeed Drôle de Rose. Giacobetti's sleight of hand plays hugely into giving this L'Artisan perfume an elegantly retro air without becoming stuffy, too sweet (though it is sweet all right) or too old. She's known for her transparent, restrained approach after all. Don't expect dark, menacing secrets and deep, meaningful confessions either. This is out for fun, pure and simple. 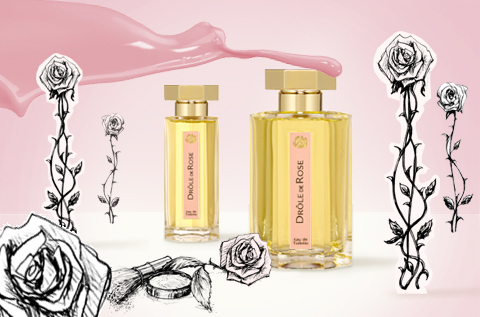 Drôle de Rose is L'ArtisanParfumeur's flirty, undeniably pretty, playful starlet, who's really a good and dainty girl through and through. The rather untranslatable name rather means something like "amusing rose", in the vein of "witty". The softly powdery accord of violets and geranium (which has a rosy scent) is given a greener, fluffier tinge via the magic of star anise. The classic "lipstick scent accord" forms the core of the fragrance; made up, lips stained rosy, elegantly ladylike, sweetly appealing. The real pull however is how the flowers are given a honeyed approach, with a non indolic and yet non soapy orange blossom water, as if one is sprinkling macaroons; a powdery feel with the trickery of irones (iris); and last but not least how the musky drydown sticks around more (but doesn't project too much) than what one would initially expect when given enough heat on skin and in the atmosphere. Contrasted with the camphoraceous, woody darkness of Voleur de Roses (based on the murky rose and patchouli), one can see how the latter is meant for autumn and rainy weather, while Drôle de Rose really blooms in late spring and summer. Even though one would be tempted to reference Paris by Yves Saint Laurent in this review, I feel that the intricate and powerful, gleaming approach in that rose-violet combo is miles removed from anything else and ultimately is its own thing: Really, I wouldn't expect necessarily loving both that and the greener, lighter, less sparkling Drôle de Rose...If you want something similar, rather try Emilie by Fragonard. I usually like neither violet or rose in my perfumes, but I love this scent! I don't wear it often but I can't help but smile when I wear it. Playful indeed. I recently had a whacky moment and decided to spritz some Drole de Rose on top of Dzing! (equal parts) and it was surprisingly nice. Definitely more than the some of its parts. A faint aldehyde note came up, making for a very classy diamond earrings kind of feel. I shall be doing it again for sure! now you're giving me ideas. Having both scents on hand, I will go and investigate. Not something I would have thought of and sounds interesting! Thanks!! I do enjoy perfumes that have a "cosmetic smell". Unfortunately I had to stop wearing Love,Chloe when my perfume hating co-worker told me that I smell like a baby diaper (guess it was the violet note). Your choice of words "functional smells" actually made me think of a functional item I recently purchased (dish detergent) which smells so outrageously great that instead of my daughters doing dishes at night as their daily chores I am doing the dishes for them! It's Meyers Bluebell dish soap and I want it in a perfume in the most terrible way! The dish soap includes various essential oils (bergamot,patchouli,clary sage,jasmine and lavender) and the scent is so intoxicating. I am now wondering if Pendhaglion's Bluebell smells similar. I am going to have to seek out a sample!